All documents that are edited by Proof-Reading.com are given more than a rudimentary grammar check. While a grammar check is essential in terms of guaranteeing that a document is readable and that it conveys its message clearly to the reader, it is not the "be-all and end-all" of editing. To begin with, a well-written document needs to concisely communicate its thesis to the reader. Therefore, every document that is proofread and edited by Proof-Reading.com is carefully examined to ensure that its main idea is unambiguously stated. Then, our editors carefully read the document to make sure that all of the content that follows that main idea logically and clearly flows from it. Perform a careful grammar check and correct errors. Eliminate all mistakes in punctuation. Replace redundant and/or weak vocabulary with better choices. Perform a thorough spell check. 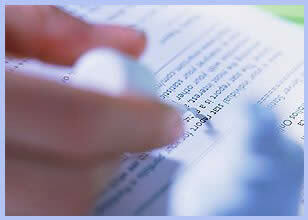 Carefully re-read the document to ensure that the sentences and paragraphs flow smoothly, with appropriate transitions. All term papers are examined to ensure that they adhere to MLA, APA, ASA, AMA, Chicago, CSE, Turabian, AP, or whichever format you indicate that you are using. A grammar check is important, but a well-written academic or business document requires much more than that.